So you're trying out Keto? As your body transitions from a glucose to fat-burning state, a number of uncomfortable flu-like symptoms may pop up. Fortunately, there are a few things you can do to help your body get into ketosis more efficiently, with less friction. I'm excited to partner with Whole Foods Market to highlight some of my favorite supplements which aide in fat-adaptation and keto flu prevention. This weekend's 25% off supplement sale is the best time to stock up and save so make your list and head to your local Whole Foods Market from January 5-7 for great deals on some of my favorite brands. As an advocate of real food, I make every effort to get nutrients from whole food sources, however, there are a few products I use and recommend to increase success while transitioning into ketosis on a low-carbohydrate diet. When beginning a ketogenic diet, it can be a challenge to eat enough high-quality fats. One of the more popular methods is by drinking what's referred to as “Bulletproof coffee” — a combination of grass-fed butter and MCT oil blended into coffee. If you've never heard of MCT oil, you are not alone. MCT stands for medium chain triglycerides, a type of fat molecule derived from coconuts. MCT oil is popular in the keto community because it is quickly converted to ketones, providing a potent energy source. There are four kinds of MCTs (C6, C8, C10, C12) and some turn into ketones more efficiently than others. 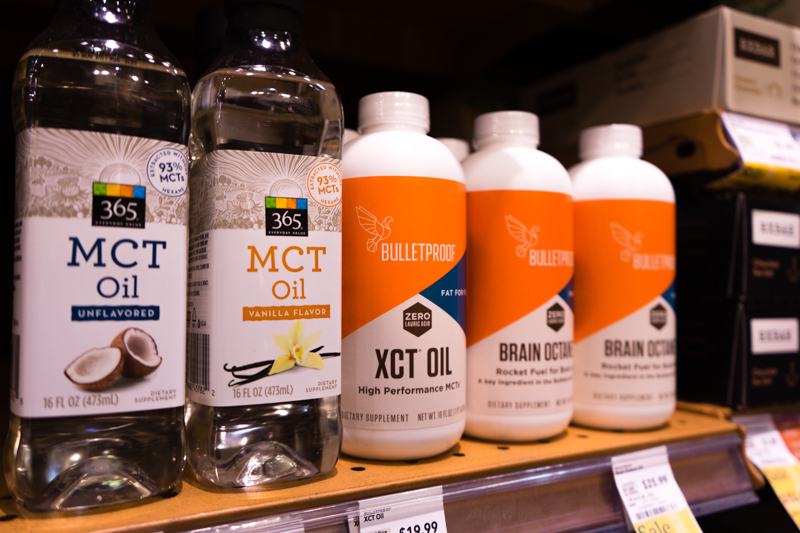 One of my favorite MCT oils is Bulletproof Brain Octane, which is pure C8 caprylic acid — a form that is particularly effective for cognitive function. As is often the case, quality comes at a premium and the price is higher than anything else on the market. I use Brain Octane sparingly when I need quick long-burning energy. For day to day, I tend to rely on Whole Foods 365 MCT oil. While it is not as potent as Brain Octane, it fits my budget and is more well-rounded. 365 MCT oil is a blend of three types of MCTS (C8, C10, and C12). While C8 and C10 are similar in mental and metabolic boosts, C12 is the strongest MCT for fighting off viruses, fungi, and bacteria. If you're curious to try a “Bulletproof coffee,” Whole Foods has just added this keto-friendly beverage to their coffee bar menu! Transitioning into ketosis can cause a temporary diuretic effect which results in a loss of both electrolytes and water in your body. This imbalance, called Keto Flu, causes symptoms such as fatigue, headache, irritability, dizziness, muscle soreness, cramping, or nausea. During the first few weeks, it's important to drink plenty of fluids and salt your food generously to prevent dehydration. I also find it helpful to supplement with electrolyte drinks and/or bone broth, especially when exercising. I rely on two products: Nuun Electrolyte Tablets and 365 Electrolyte Plus Powder. Nuun has great flavors and the packaging is convenient. I typically use Nuun at home because it's a large solid tablet that takes several minutes to fully dissolve. On-the-go, I prefer 365 Electrolyte Plus, which is a powder that can be quickly poured into a water bottle to drink immediately. Bone broth is also a great source of electrolytes, vitamins, and minerals. I like to make this from scratch, but when I'm short on time or on the go, I am a fan of Vital Proteins Bone Broth Collagen. Magnesium deficiency is fairly common among adults, especially as the body increases the excretion of ions from the body during fat-adaptation. This lack of minerals, including low magnesium, can lead to fatigue and muscle cramps. I've tried various magnesium capsules and tablets, but I always come back to Natural Calm, an anti-stress drink made from a highly absorbable blend of ionic magnesium citrate. I prefer original unflavored because it is free of sweetener, but it also comes in stevia-sweetened flavors including raspberry-lemon, sweet lemon, orange, and cherry. 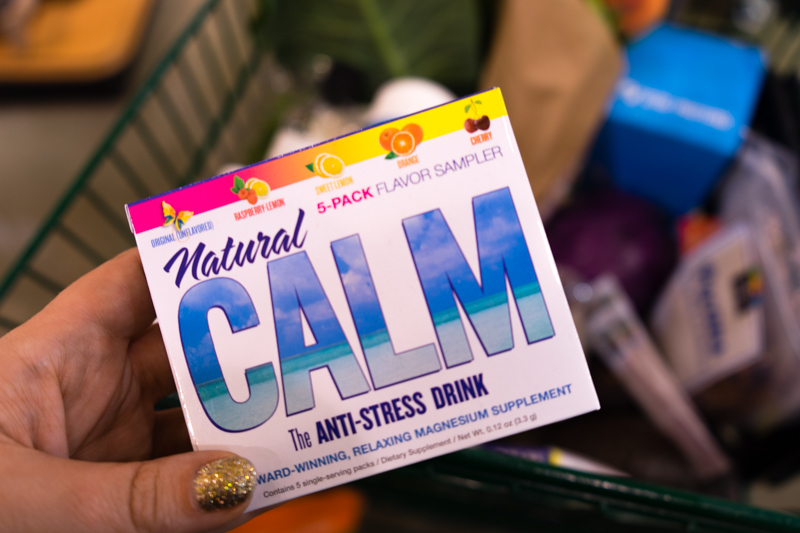 Natural Calm also makes single-serving packs that are perfect for travel. Another benefit of Natural I always keep one in my bag to aid in sleep and regular bowel function. If you prefer to get your minerals in capsule form, MegaFood Calcium, Magnesium, and Potassium is a great source. I recommend including as many of these nutrient dense foods as possible in your meals, particularly during the first few weeks. This post was created in collaboration with Whole Foods Market. As always, all recommendations and opinions are my own.